For a family that’s not much bothered by celebrity autographs we seem to have nonetheless acquired a few as part of our collection of film and rock ’n’ roll memorabilia, an ongoing hoard that competes for shelf space in a small house with about 2,500 books and god knows how many comics, records and action figures. We’re not serious collectors, like our friends Matt and Ray at Geek Shelf, whose walls are covered in signed convention photos of them beaming next to a positive pantheon of sci-fi and horror legends; our stash is much more limited and, to a certain extent opportunistic, if not downright eclectic. The best of my bunch is probably my signed 8 x 10 of Jon Pertwee and a copy of Bernie Wrightson’s Creepshow comic which Ray got George Romero to sign (if anyone’s in touch with Stephen King, it really needs his John Hancock to complete it), about both of which I have written elsewhere. Gracie also bought me a playbill from Song of Scheherazade (1947) autographed by Yvonne De Carlo, Lily Munster herself. Gracie, meanwhile, proudly owns a glamour shot from the Confessions of a Driving Instructor era signed by the model, a young Lynda Bellingham, and a poster of the movie Sharktopus (‘half shark, half octopus, all terror’) autographed by the star, Eric Roberts. I also got her a signed headshot of Peter Capaldi in a charity sale, which I hid in a homemade Christmas card drawn like a little TARDIS. We have a few other odds and ends, too: the Alien Tetralogy signed by Lance Hendrickson, and an original copy of Space Ritual that I got Hawkwind to sign while I was hanging around with Nik Turner, Bruce Lacey and the Satan’s Slaves in the early-80s, about which the less probably said the better. 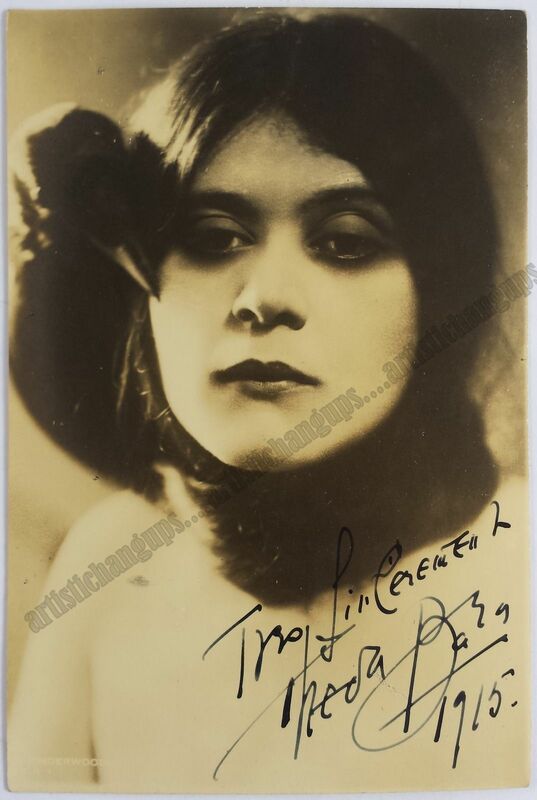 Lovely though all this stuff is, it’s not particularly likely to get a film historian or philographist that excited, but we did get something recently that I reckon would: a signed photo of Theda Bara, the first true gothic movie icon. The beautiful sepia portrait is dedicated with a flourish, ‘Très Sincèrement,’ and dated 1915. It shows Bara (then thirty) in one of her trademark exotic headdresses – a crow with one wing wrapped around her throat – in an image later used on the theatrical poster for The She Devil: The Story of a Beautiful Woman Without a Conscience. In full stage make-up, those famous ‘hungry eyes’ stare you down from a century ago. Gracie works at the University of East Anglia these days, and we had the package (ordered from the US) sent there for safety. When the word got out, academics from the Department of Film Studies were wandering down all day to check out a relic of one of the greatest stars of silent cinema. The autograph is fully authenticated by PSA/DNA, and wasn’t as expensive as you might think, but by the same token more than I usually have in my back pocket! But I had a reason to buy it. It was sort of a fee. 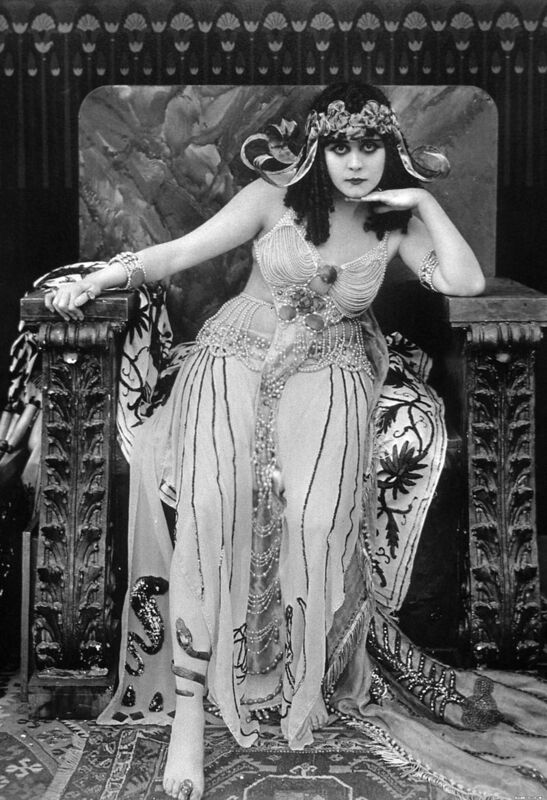 Madame Theda Bara of the Fox Film Company is known artistically as ‘the original vampire’ because of her exotic and successful portrayal of adventuress roles. She was born in Egypt, on July 20, 1890. Her education she acquired practically everywhere, for she has travelled almost constantly ever since she was a wee kiddie. She adopted the stage as a profession and for a number of years played at the Théâtre Antoine in Paris. Her hobbies – you’ll never believe it – are occultism, green jade elephants, odd jewels, incense, orchids and music. How’s that for a temperamental combination? In appearance she is striking, to say the least, with her black hair, green eyes and olive skin. She is five feet, six inches tall and weighs one hundred and twenty-nine pounds. She politely evades questions regarding her matrimonial status (Life Stories of the Movie Stars c. 1920). The legend was that Bara was the daughter of a French actress and an Italian artist, or possibly an Arab sheik, born in a Bedouin tent in the shadow of the Sphinx. Press conferences were held in sealed and darkened rooms full of roses and lilies, for the Arabian star, it was said, detested the cold. In fact, Bara was born in the suburbs of Cincinnati (five years earlier than the studio claimed); the middle child of European Jewish immigrants, she had been to neither Egypt or France. Working for William Fox, Bara’s talent made the studio. Her carefully cultivated on-screen persona was the ‘Vamp,’ a femme fatale who captivated, seduced, discarded and destroyed men, sometimes for profit, sometimes for sport. In A Fool There Was (1915), for example – which we recently acquired on DVD – broken ex-lovers appear throughout the story, destitute, suicidal, and still under the fatal woman’s weird sexual spell. As an archetypal icon, Bara is very much the double of the ‘Girl Next Door,’ as personified by ‘America’s Sweetheart’ Mary Pickford, as much a shadow in the dark water as Bettie Page was to Marilyn Monroe in the 1950s. But despite Bara’s salacious image and her famously revealing costumes, part of the ‘Hollywood Babylon’ culture that would be censored to oblivion by the Motion Picture Production Code of 1930, her private life was as wholesome as her screen roles were profligate and wicked. Tired of being typecast, she did not renew her contract with the Fox Film Corporation, and returned to the stage in 1920. She married British-born director Charles Brabin in 1921, and effectively retired, making only three more films, the last, 45 Minutes from Hollywood, in 1926. As her biographer, Eve Golden, notes, she did not live long enough to be rediscovered, like Lillian Gish, Blanche Sweet, and Gloria Swanson, the latter memorably sending up her silent career, with more than a few nods to the reclusive Bara, in Sunset Boulevard in 1950. While retaining an interest in the arts, often publically supporting younger actresses, such as Mae West and Greta Garbo, Bara and her husband lived a quiet and good life in Beverly Hills, until she died of stomach cancer in 1955, aged sixty-nine. The couple never had children. She is buried in The Great Mausoleum of that most hyper-real of Californian cemeteries, Forest Lawn Memorial Park in Glendale. My wife adores Theda Bara, and I cannot deny that when we first met, her dark, hypnotic eyes, long black her and elaborate eye make-up instantly recalled to me the famed ‘Serpent of the Nile.’ She loves the films, such as they are, owns the biographies, and belongs to various online silent movie discussion groups. She has also drawn Bara several times. Not long ago, she got very excited when she saw an autographed photo of Bara on EBay, which is the point of this post. It was three figures, so I did my usual thing of noting that it was interesting and then ignoring it. But then it occurred to me that my beautiful and talented wife was at that point designing my latest book, from painting the cover all the way down to typography and layout, a huge job for which our company would generally charge several hundred pounds. OK, a Golden Age Hollywood autograph was a bit more excessive than a new Pandora charm as a spontaneous present, but I figured for the work Gracie’s been doing on this book it was cheap at the price. We did a few sums, moved some funds around and tentatively made an offer, which was accepted. Ronald Genini, Theda Bara: A Biography of the Silent Screen Vamp (Jefferson: McFarland & Company, 1996). Eve Golden, Vamp: The Rise and Fall of Theda Bara (Chicago: Vestal Press, 1996). Wonderfully written!! Your wife DREW those pictures? They are very nice looking. A friend suggested that Eve Golden biography the other day; I think I need to find it. Has your wife heard of the Theda Bara Sandwich? Well I tried it and it is so good! Haha. Check out my blog post about it, if you will.